One of the good things about working in the service industry is the money. Not the pay, that's not all that great, but working with the money that the customers bring in. Somewhat often they end up paying with old coins and bills. I can buy these out of the drawer and collect them. Above, you can see some of the pieces that I've bought over the years. 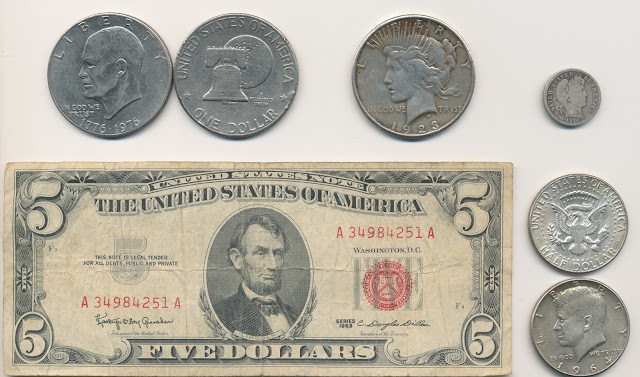 The most recent is the $5 bill, which I got a few days ago. It might be worth a little more than $5, but it's not the value that I'm after - it's the age. I love that a bill printed in 1963 is still in circulation. And a barber dime from 1916, a Peace dollar from 1923, a JFK half-dollar from their first year, 1964, and Eisenhower half dollars from the bicentennial.